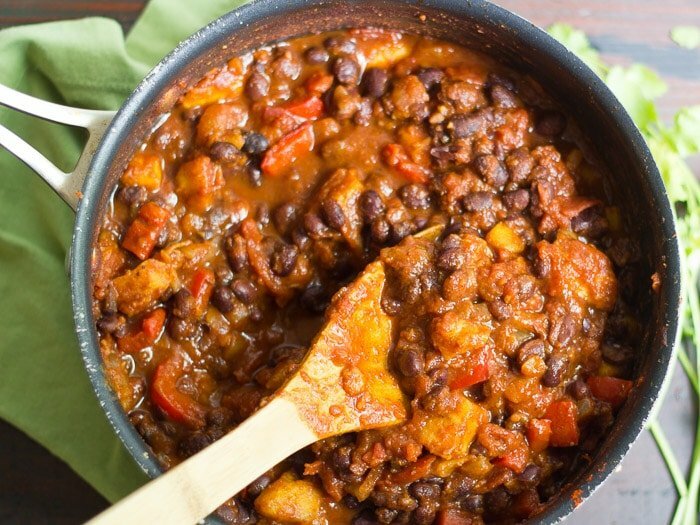 Hearty black beans and chunks of ripe plantains are simmered up in a spicy tomato base to make this knock-your-socks-off sweet and spicy plantain chili! Every time I cook with plantains, which is not nearly enough, I tell myself I need to cook with them all the time. Here’s the thing: plantains are cheap, delicious as heck, and as far as exotic produce goes, pretty darn readily available. I remember seeing plantains in the vegetable bins way back when I was a kid, and back then there was way less of a demand for super cool fruits. I always thought they were weird bananas, and they kind of are, but a thousand times better. 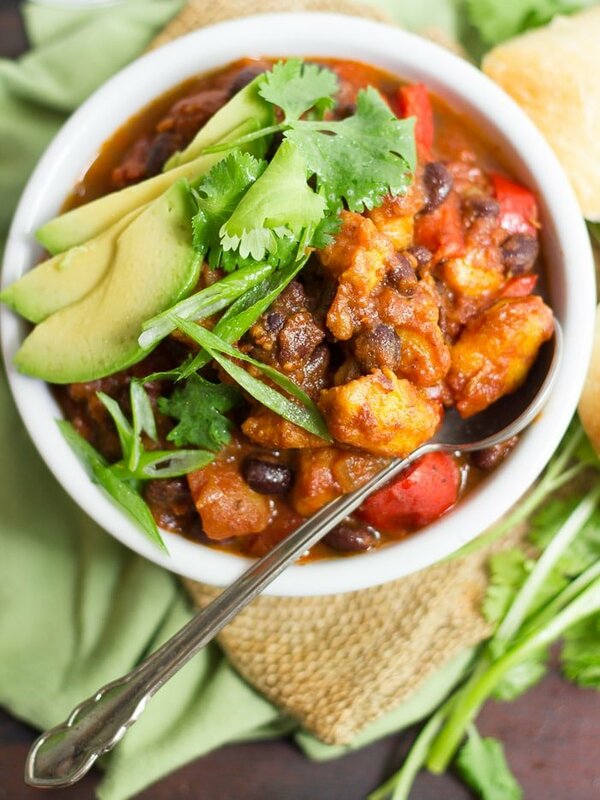 I’m a sucker for sweet and spicy flavor combinations, and it’s just about (or exactly) the beginning of fall, a.k.a., chili season as someone once told me, and so, this plantain chili was born. 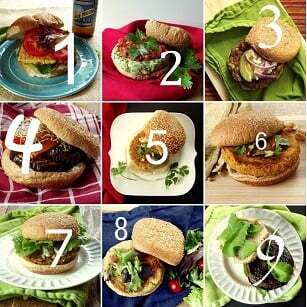 My last plantain recipe on this site (okay, my only other plantain recipe) was for some burgers. That one also involved some smoky, spicy black beans, but it’s very different from what’s going on here. Couldn’t be easier. I had this urge to do fancy things with my plantains. Fry them up maybe? I don’t know, but in any event, I resisted, and I’m happy to report that plantains, thrown into a stew, are as delicious as you’ve ever had them. And if you’ve never had them before, there’s no better place to start than with the recipe right in front of you. Coat the bottom of a large pot with oil and place over medium heat. When oil is hot, add onion and bell pepper. Sauté until softened and onions are translucent, about 5 minutes. Add garlic and sauté about 1 minute more, until very fragrant. Add beans, crushed tomatoes, diced tomatoes, chili powder, cumin, paprika and ancho chili powder to the pot and give it a stir to incorporate everything. Bring to a simmer. Lower heat and allow to simmer, stirring occasionally, for 15 minutes. Add plantains and simmer 10 minutes more, stirring occasionally, until plantains are softened but not yet mushy. Remove from heat and season with salt and pepper to taste. Divide into bowls and top with toppings of choice. Serve. This looks amazing! This past summer, I discovered mashed plantains with collard greens (and ginger and peanuts!). 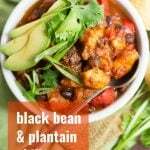 There is seemingly no end to the things plantains will happily combine with. Yum I make something like this, my spouse is Puerto Rican and this is very traditional. Please write a cookbook. ; D Yours is always the first site I check when I need an idea for dinner because almost always it’s things I have on hand and can do in time on a weeknight. Most importantly, I haven’t had a recipe fail me yet. Thanks for them all. Thank you so much Carla! I’m glad you’re enjoying the recipes and so thankful for the encouragement. :) I’ve had a few talks with publishers in the past year, but nothing that was a good fit just yet. Hopefully soon! 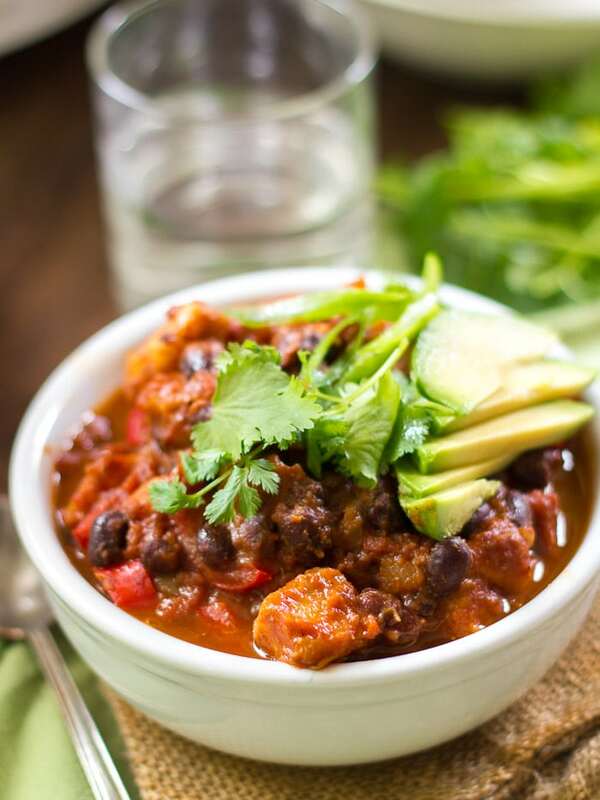 Now that it’s officially fall I am all about the different chili recipes. Thanks for this one, looks awesome! Glad you enjoyed it!! Thanks so much!